As way of showing Saint Seiya fans some love, Bandai released the Harpy Valentine Saint Cloth Myth figure around Valentine’s Day this year. Which is fitting since his name is a pun on the holiday saying “Happy Valentine’s Day”. Harpy Valentine is one of Hades’ 108 Specters. The 108 Specters were derived by Kurumada from the 108 demonic overloards of Taoism, who are represented by 108 stars of destiny. Valentine is the Celestial Wailing Star. In the Saint Seiya anime, Harpy Valentine makes his first appearance when he drops the defeated body of Phoenix Ikki at Cocytus, the 8th prison of hell reserved for the mortals who would dare raise their fists against the Gods. On this trip to the icy wasteland of Cocytus, Valentine found that Pegasus Seiya, who had arrived there earlier, was still very much alive, although mostly frozen into the crust of the land .Seiya convinces Valentine to free him with the proposition that they will fight and if Valentine wins, Seiya will hand over Athena’s Cloth to him. Valentine almost makes short work of Seiya, who has been weakened by his imprisonment in Cocytus. However, in the end Seiya prevails over Valentine thanks to his resolve to deliver Athena her God Cloth, which she will need for the imminent battle with Hades. 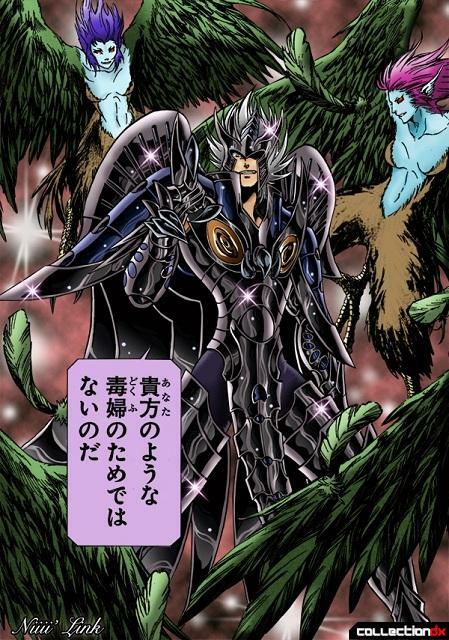 In the Saint Seiya manga, Valentine encounters Seiya right before the Bronze Saints enter the underworld; which happened much earlier in the timeline of the Hades arc. Harpy Valentine’s appears to help his master, Wyvern Radamanthys, to dispose of the Bronze Saints, revealing to the readers his places in Hades’ army. His earlier introduction in the manga serves to build tension between Seiya and Valentine, whose fight is postponed because Radamanthys tells Valentine and his other subordinates to pursue Athena, who is already in the underworld. Like many of the other Saint Cloth Myth releases, Harpy Valentine is packaged in a book style box. 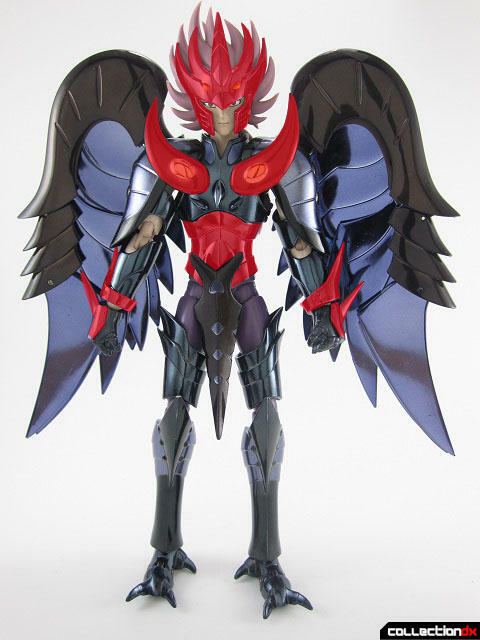 The Object mode for Valentine is a Harpy, which in Greek mythology were vicious creatures that would torture and take people to the underworld (which is why Kurumada used Harpy Valentine as the Specter who transports the fallen Saints to Cocytus). In Greek Mythology, the Harpies had the body of a bird of prey and the head of a woman. The Object Mode's human face is barely visible under the headpiece. I really dug the Object mode for this release because it looks pretty ferocious and it is quit big. The body for Harpy Valentine is a generation 3 Saint Cloth Myth Body. Although most of the bodies in the Saint Cloth Myth line are fairly similar, with the exception of height and color, Valentine’s legs and feet make him stand out amongst the other Saint Cloth Myth bodies. He has a HUGE stride and he can use it thanks to the claws on his feet, which give him extra stability. In full armor, Harpy Valentine looks very formidable. The metallic black and blue paint job, along with the many protrusions of his cloth make him a dark and fearsome looking Specter. Although aesthetically pleasing, the armor design provides one major hindrance to the mobility of Valentine, when he is in full armor: the shoulder pads greatly restrict the lateral movement of the arms. Due to their shape they can only move upwards a little before they touch the chest armor, effectively stopping any further movement of the arms. However, this does not stop Harpy Valentine from being able to pose for his signature attack is “Greed the Live” (gotta love Engrish attack names! ). These are a bit easier to work with and are meant for posing the arms forward. A while back, Bandai hinted at the release of Harpy Valentine, stating that it would be a “chocolate flavored” Saint Cloth Myth release. 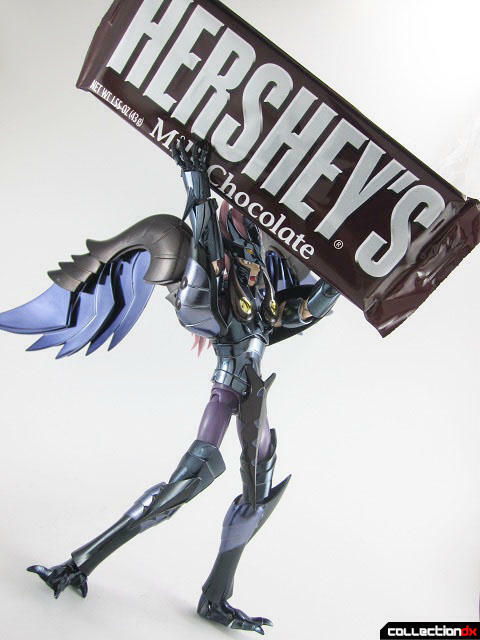 This hint was obvious to the fans that follow the Lost Canvas manga, because in the Lost Canvas manga, Harpy Valentine also possesses another attack: “Sweet Chocolate”. Since I am not that far in the Lost Canvas story, I always assumed it looked something like this. Turns out, it looks more like this. Harpy Valentine summons Harpies from the Underworld to ravage his opponents and consume their souls. So how do you go from Harpies devouring souls to a chocolate-named attack? It turns out that souls taste like sweet chocolate to the Harpies that Valentine summons. The face and hair sculpts are really great. I especially dug Valentine’s hair, which swirls up from his head in multiple layers making it look like flames radiating from his head. A second action face was a great addition to this release. 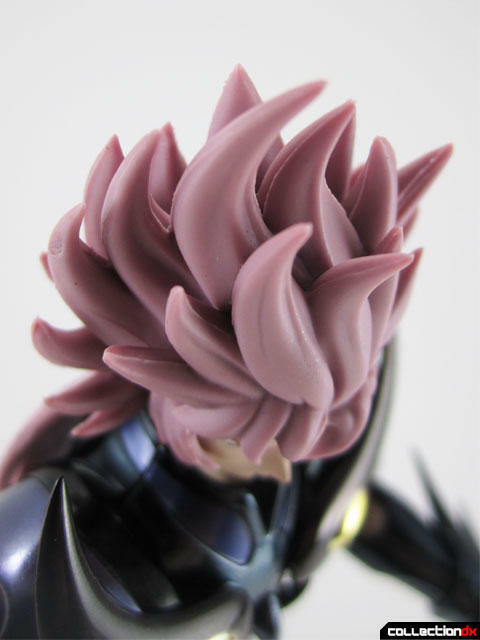 Many of the Saint Cloth Myth releases come with just one face sculpt, which is usually neutral. The “shouting” face of Harpy Valentine really makes all action poses so much better. I also liked his hands, which are the only claw shaped hands in the Saint Cloth myth line. I was expecting them to be hard and thus quite sharp. Lucky for me and my fingers, they were actually made of a soft plastic. The wings for Harpy Valentine are freakin’ AMAZING. Not only do they swivel forward and back, but they also extend up and down and can fold out to reveal extra feathers. 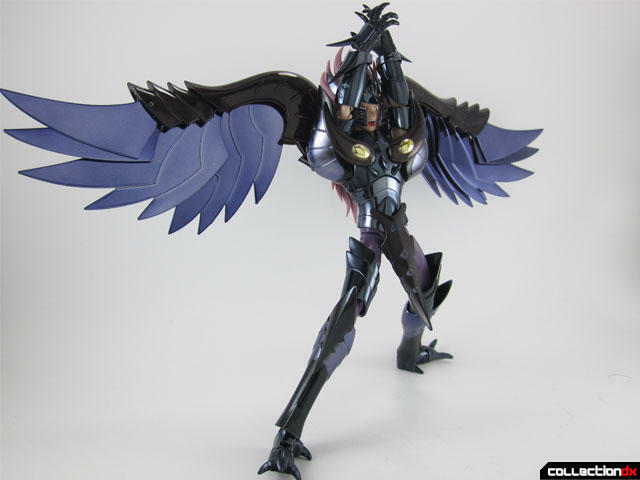 This is tons better than the wings for many of the other Saint Cloth Myth releases , which are usually just a single piece of plastic and/ or have limited mobility. One thing that I did not like about the wings is that the top part of the wing structure has a cover that goes over it. The decision to add a cover instead of making this part a single piece did bother me , since I am sure there must be some reason that Bandai did this. What did bother me, however, is that the cover does snap into place over the main piece and hold in place. So touching the cover can either cause it to move out of place revealing the part underneath, or completely having the cover come off. As a percentage of the whole armor, Harpy Valentine has quite a lot of plastic. However, once you factor in the fact that the wings on many other Saint Cloth Myth are made of plastic, then the scale tips a little bit more towards the die-cast side. Besides the wings; the covers for the top of the hands, cuffs on the armguards, the armor for the abs/lower back, the headpiece and the tear-drop shapes on the chest armor are made of plastic. The thigh armor, the leg armor , armguards, the shoulder guards and the chest armor are made of metal. Although this release has a few quirks and little in the way of extras, it is still a solid addition the Saint Cloth Myth line. Just the engineering in the wings makes him stand over many of the other winged Saint Cloth Myth releases. However, since Harpy Valentine is a minor character, it is ultimately up to each person to decide whether or not they will accept ( buy) Bandai’s Valentine’s Day present.